Garbiñe Muguruza won her second Slam, defeating Venus Williams in Saturday’s Wimbledon final, 7-5 6-0. Muguruza saved two set points in an enthralling opener, before taking control and dropping just 12 points in the second set against a fading, Williams. In a high quality first set where both served very well and swiped away a break point on their own serve, it was Muguruza who faced danger at *4-5 *15-40 and down two set points. The one area of concern early on had been Muguruza’s forehand, which was leaking errors long. On the first set point and in a thrilling 19-shot rally, Williams tried to break down the forehand. Muguruza held firm, eventually getting the error from Williams. Muguruza saved the second set point with a decent serve that forced Williams long on return. Muguruza had been playing the big points exceptionally well all tournament and once again, she held her nerve in the crux moments. Muguruza went onto win the first set, 7-5, increasingly being rewarded for turning this into a physical match with longer rallies. After that first set point, the Spaniard shored up on her forehand side and made very few errors, playing the aggressive baseline game that has been so impressive all tournament. A particular highlight was Muguruza’s defensive high ball that remarkably landed in to bring up two break points in the game at 5-5. The momentum had well and truly swung as Williams committed an avalanche of unforced errors in the second set. The American tried to change things up by coming forward, but Muguruza was just so secure in all aspects of her game, absorbing pace and producing a handful of clinical passing shot winners. From a competitive angle, i’m sad how quickly the second set went with Muguruza rolling through the final few games. The match was decided on a Hawkeye challenge. Loved the exchange at the net and credit to Venus for her wonderful sportsmanship. "I'm sure it means so much to you [Muguruza] and your family, well done today – beautiful"
I stand by my comments in the final preview – Venus Williams is truly inspirational. Her achievements this week will move her up to number four in the Race to Singapore. For Muguruza, she played stunning tennis during these two weeks and was spot on with her tactics all tournament, finding an almost perfect balance between defence and attack. It felt like there was a purpose in the way Muguruza was playing her tennis and that hasn’t felt like the case for much of this year. Ekaterina Makarova and Elena Vesnina won their third Slam together and first at Wimby, winning 6-0 6-0 (!) over Chan Hao-Ching and Monica Niculescu in 55 minutes. The match didn’t get underway until 21:30pm after a longggg men’s doubles final. Makarova and Vesnina were in stunning form, although the match was closer than the scoreline suggested with quite a few deuce games early on and Chan and Niculescu having some game points in the second set. For photos of Azarenka-Vesnina, Osaka-Strycova, Team Bucie and Giorgi-Keys, all my best shots from day 3 are up on the Moo’s Tennis Blog Facebook page. In her 20th appearance at Wimbledon, Venus Williams reached her 9th final and her first since 2009. It was wonderful to see Sloane Stephens back in action after almost a year off the tour due to a foot injury. Sloane lost in straight sets in her first round match to Alison Riske, but did pick up a win in doubles action with Chang Kai-Chen. There were some fantastic matches during this tournament and here are a selection of my favourites. My favourite match of the tournament. Kerber played her best match of the year, yet Muguruza’s persistence to come forward and go after her shots in the crux moments of the third set was ultimately the difference. The biggest upset from the first week and a damn good match with Rybarikova producing one of the impressive individual displays of the tournament. An incredible effort from both Konta and Vekic, putting on a show on Centre Court. Another great Centre Court battle, this time under the roof, where Konta showed tremendous resilience to outlast the French Open finalist in three thrilling sets. My hipster match of the tournament from the second day of the Champs out on Court 14 where Martic scored a first round extra-time upset over Gavrilova. The clash of styles was wonderful to watch. This could be classed as a Rybarikova hot shot, but it was just a smashing point all round. On-the-run forehand from Jelena Ostapenko… awesome! From the Martic-Gavrilova match already discussed, this was a gorgeous passing shot winner from Dasha. After a magnificent match, this was just wonderful to see at the net from Jo Konta and Donna Vekic. A longg embrace between Angelique Kerber and Kirsten Flipkens after their fun second rounder on No.1 Court. Andrea Petkovic is the best. A nice moment with Dominika Cibulkova after a brutal first round match, which Cibulkova won, 6-3 3-6 9-7 in two hours and 43 minutes. "That's a man. In a skirt. Trying to return Kim Clijsters' serve"
This interview with Petra gave me goosebumps… good work, WTA. "At first, I was happy that I'm still alive"
Loved this from Hannah Wilks. One of my favourite follows on Twitter. 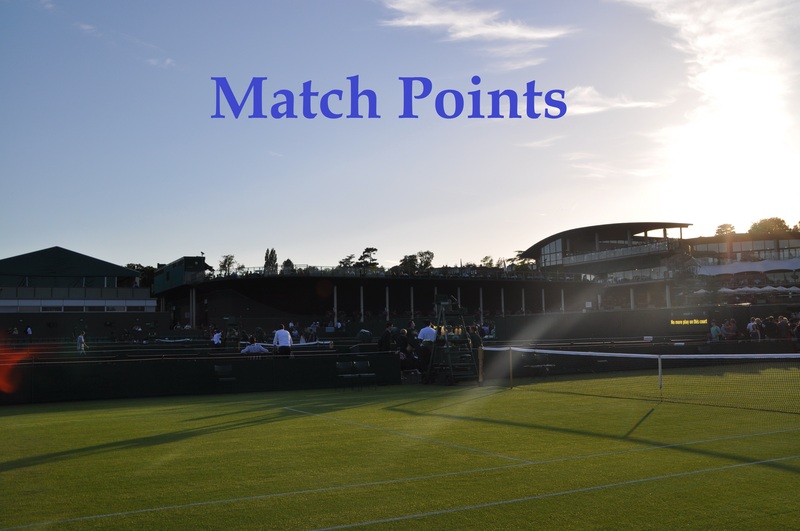 A few of my favourite posts from the week… here’s a duo of write-ups from my day at Wimbledon. Congratulations to loucee who won the Draw Challenge for Wimbledon and correctly predicted both finalists! To join in the fun, you can enter Tennis Draw Challenge and join the Moo’s Tennis Blog league. Congrats to Muguruza(Conchita as well, turning her season around)! For all things that’s great and good about tennis, I hope we get a consistent Garbine from now. That patchy thing in the past is disappointing. I reckon we could well see Venus again at the USopen, and Caroline gets her chance too to snag one. Team Bucie could lose their number 1 ranking by year’s end I think. Kudos to the new WTA no.1 ranked player. Will be cheering for Watson/Kontinen against Hingis/Jamie for mixed doubles. As always, cheers James, to another wonderful slam coverage. Looking forward to the USOpen, and if the rankings are anything to go by, it is fairly wide open too. Well to be fair, before Wimbledon this has been Muguruza’s most consistent year on tour… 4th round at French, Quarters in Aus, SF in Brisbane and Rome, QF in Indian Wells. Shes won at least a couple of matches at all the bigger events bar Madrid. And her 29-12 winning percentage is higher than the past few years. Yes, there is truth in that Andrew, I’m just not, fully, a believer in her long term approach. I guess seeing is believing so will wait and see. She likes this tournament, but this time, her stats throughout the tournament are also reflective of a certain mindset hence my acknowledgement of her ‘coach’. I really like this kind of tennis and maybe I’m spoiled by how dominant she was through the tournament, it shows how good she could be with a similar mindset. A great foil to a confident Kvitova or Pliskova or Coco or whomever. Just makes the top 10 more exciting. Anyway, I wish her the best, I like her game. Yeah I agree that her play style with Sam isnt working for her. He’s somehow taken her pretty great forehand and made it wildly inconsistent and a weakness to exploit. Last year she was far too aggressive and this year she’s been almost too passive trying to tone it down. Thanks, let’splay! And thanks for all your thoughtful comments. Definitely in need of a few weeks off from tennis but I am excited about the summer hard court season and more so than in previous years. The US Open should be another fun one! Haters can exit, Muguruza definitely has what it takes to be the top player on tour and shes shown it this tournament. You’d probably have to call this her best year on tour now… lets see what she does with the rest of it. She hasnt been typically successful on US hardcourts in the past. Intrigued to see what she can do going forward but remaining wary! I don’t think she has made it past R2 at the US? Surprises me as I think the fast hard court would suit her game. Yep all true. Muguruza is on the entry list for Stanford in two weeks time. Petra made the quarters at the US Open a couple of years ago, but went out to the eventual winner (Flavia). I think as an asthmatic she struggles with the late summer humidity in New York (and yet she seems to do well at New Haven – funny that)? I don’t know what the problem is with Garbine and the US; she won a tournament in Asia (I think it was Beijing) a couple of years ago, so she seems to be OK there. I agree about Conchita probably being too busy to work with her full time. Muguruza’s best surface was called to be hard court. Funnily, she won her slams on natural surfaces. Imo this is way more difficult than winning the other both hard court slams so I’m sure she will win the other two some day. Bit pushed for time right now but should like to say this; congratulations to Garbine obviously, and I’d like to see her working with Conchita in the future; she seems to be better for Garbine than Sam is. Magnificent fortnight of tennis from her anyway. About Petra; it’s incredible how far she’s come, even winning another title in Birmingham last month, but all the same I think she’d do well to consider trauma counselling. There are forms of it now that don’t require you to relive the incident in question. I agree, I think most of us have the same feeling about the partnership with Sam! I did read that Garbiñe was on the phone to him every day. I doubt that Conchita has the time to work with Garbiñe full-time. They should do something to the bottoms of the trophies. The winners hold up the trophy and most of what you see is the ugly empty bottom. Even a red felt plug in the bottom of the trophy would be better than nothing. Patty Schnyder wins the ITF 25k at Perigueux, Fr and moves up to WTA # 258 with 194 points, which is only 6661 points from #1. Patty is in the main draw at Gstaad. Gooooo Patty! Good spot there, Ziggy! I noticed she had a WC for Gstaad. ATP- Junior boy Wimbledon winner Alejandro Davidovich Fokina has a Swedish father a Russian mother and represents Spain. I saw part of the match with Patty Schnyder in Gstaad. Patty looks in great shape, but her emotions appear to be her biggest flaw, as she couldn’t control her shots in a game pressure situation. Patty won her round one match against a 27y/o player ranked #273. Schnyder won the first set and was up 5-2 in the 2nd but couldn’t finish. Patty had 4 MPs in the 2nd set tie break and lost. She had 3 MPs in the 3rd set tie break before finally winning. I didn’t realize the the WTA had a big headline write up on Schnyder, including nice picture of Patty with her little girl. Kontaveit beats Kalinskaya 6-4,4-6.6-4. Big write up at the WTA site. The 18y/o Kalinskaya appears to have a good solid baseline game but was over powered by Kontaveit. Kontaveit missing the lines not by inches but by 5 feet was the only reason the match was close. IMO Kalinskaya will be a top 50 player in the future, but could be higher if the 18y/o develops some power. I think Kalinskaya beat Garcia earlier in the year in KL? Haven’t watched a great deal of her play but definitely will be keeping an eye on in the future. Kalinskaya was a talented junior, she reached the finals of Roland Garros. And since she’s had good successes on the ITF making 10 finals (winning 4), mainly on clay. She’s a very attractive girl, I bet sponsors will be lining up for her if she starts getting wins on the main wta tour. Watch Aga’s fun wedding dance on Twitter @michal1497 . Best wishes to Aga. Kiki Bertens beats Kontaveit 6-4,3-6,6-1. The bookies had Kontaveit a slight favorite but I thought this would be a relatively easy win for Kontaveit. Kontaveit appears to lose concentration at times. At the end of the match Bertens broke down and was quaking/crying. Good tournament win for Kiki. I’m trying to get my head around how Kiki is such a force on clay, yet hasn’t really translated that to other surfaces. I would have taken Anett to win the final too, still another good week. I see Anett has pulled out of Bastad next week. ITF $80K in Olomouc,Czech Rep—-#217 Bernarda Pera(never heard of her) defeats #41 Kristy Pliskova 7-5,4-6,6-3 on her home ground. Girls are coming out of the woodwork to beat top 50 WTA stars! Why on earth was Pliskova even playing an ITF event anyway? She played one in my neck of the woods (Barnstaple in North Devon) a year or so ago, and even won it. It’s frowned upon on Tennis Forum (they call it “vulturing”), but one thing that can be said for it is that it gives people the chance to see top players in action who wouldn’t otherwise be able to. I believe tournament management likes local star power to fill the seats. I watched part of the final between Kris Plis and Pera and nearly every seat was filled, which is very unusual for a ITF event. And makes sense since it was in the Czech Republic. Assuming it was hard court? And Graham – I don’t really jump on board with the whole “vulturing” malarky also. Goodness, didn’t see that result. The Olomouc tournament was on clay. Bernarda Pera appears to be a clay courter, since she has a 27W-4L record on ITF clay matches since 10-Apr-2017. Unfortunately, being in the finals at Olomouc caused her to miss the qualies in Bastad. Bogdan being in the semifinals in Bucharest caused her to miss the tournament in China. IMO the WTA should have a series of small(125k) CLAY tournaments in Europe running through Sept 15. Now the clay court specialists have no place to compete in an effective manner for the next 6 months. Since Bertens passed the Witthoeft test in Bastad, I’m picking Bertens to pick up her 2nd trophy in two weeks. Caroline Garcia will be a tough test, despite their h2h. She’s beginning to string these high, high quality performances together now. She was just ruthless against Errani yesterday! Does CSN(one of my favorites) losing to Mertens,mean that CSN is now a perpetual 30s ranked player? I jinxed Bertens, as soon as I picked her to win the tournament, she withdraws. Yeah its a shame to see Bertens out. Nice to see what the 21 yr old Czech girl Barbora can do, though. She’s had some impressive runs on clay this year! At the Wozniaki vs Golubic match there was a near full house. Wozniaki does draw a crowd, unless all the fans came out to watch Golubic! A little unusual, Golubic’s coach is her sister.